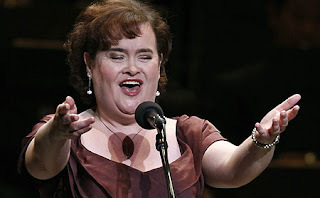 Celebrity Cosmetic Surgery: Susan Boyle - Plastic Surgery? Every time Susan Boyle returns to the spotlight people speculate whether she's had plastic surgery. She does look SO much better than when she first wowed audiences on Britain's Got Talent. But has she really had plastic surgery to look the way she now does? Doubt it! Her aesthetician has done a very nice job waxing her previously out-of-control eyebrows, but other than that she's probably just had some nice primping and a fashion makeover. She looks like she just finished a segment of What Not To Wear. How do I know she hasn't had any real plastic surgery? The one surgery that could really benefit her is a facelift. A few hours under the knife and that double chin would be history. It wouldn't make a lot of sense for a plastic surgeon to operate on anything else on her face. Plastic surgery or not, she's an amazing singer. I wouldn't be caught dead buying her album (unless it was for my mom) but her voice can even make me get a little weepy (don't tell anyone!). Yes, her singing makes me a bit weepy too. I love her the way she is...double chins and all. every time I see her face it reminds me of a bucket of sand.